It doesn't matter what I pack in our kids lunches, they always come home STARVING. This means that I have to be ready with a snack when they get home. Today our snack was so yummy, I had to share. 1. Combine peanut butter, yogurt, milk, 2 tablespoons honey, and vanilla in a blender or food processor until smooth. 2. Pour peanut-butter mixture into eight 6- to 7-ounce paper cups or pop molds until they're one-third full. Cover and freeze for 1 hour. Cover and chill the remaining peanut-butter mixture in the fridge until needed. 3. Stir together raspberries and juice, divide among the cups or molds, and insert sticks. We didn't have any popsicle sticks so I just used plastic forks and spoons. I actually like them better because they provide a better "handle" for our two year old. I worry the fork is too pokey for our youngest so she gets the spoon. Feel free to use regular silverware if that is all you have. Just remind the kids not to throw them in the trash when they are done. Cover and freeze for an hour. Then fill with remaining peanut-butter mixture and freeze for 8 hours, or until firm. 4. 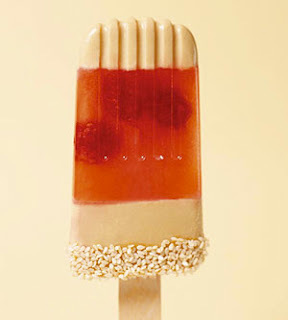 Take the popsicles out and let them sit at room temperature for about 5 minutes before unmolding. If you want, spoon honey around the rims and sprinkle on sesame seeds. If you don't want to wait for them to start to thaw, just run the cup under warm water for 10 - 20 seconds, it will free the "pop" right up. I started making our popsicles after I took the kids to school. About 9:30 or so. They were only in the freezer for about 6 hours and they were frozen just fine. I made some with honey and sesame seeds and some without. The kids loved them both. Probably the ones with seeds more. Everyone will love these. Unless you are like my grandma who doesn't like peanut butter. I never understood how that could be. WHAT DO YOU SERVE TO HUNGRY KIDS AFTER SCHOOL? Those sound so great! Perfect treat for these last warm days before fall/winter! Get all the information of Microsoft windows shortcut keys in a single website.